Kill Lu'ah Al-Skaven in Ansilvund. Make your way through the ruin. During your adventures, you may come across the rare book Of Fjori and Holgeir, the tragic tale of a huntress and a warlord who fell in love fighting each other during a battle between forest clans. They fought to a standstill until her sword broke his axe and his shield dulled her blade, and their love was so obvious that the battle instantly ended and brought peace to the forest. When winter came, a snake bit Holgeir, and Fjori obtained an elixir from Akavir to cure the poison. While she was giving the healing elixir to her loved one, instantly curing him, the snake bit her as well, and Holgeir couldn't save her. Out of grief, he built an ancient tomb and took his own life, hoping to rejoin Fjori in Sovngarde. The Nordic ruin of Ansilvund is hidden in the Velothi Mountains, far north of Riften, and can be reached by following an unmarked path east of Cragslane Cavern. Near the entrance you will find the book about Fjori and Holgeir on a table, protected by a hostile conjurer, hinting at unsolved mysteries inside. "I am Lu'ah Al-Skaven. Who are you to disrupt my work? Begone, or I will add you to my army of the dead!" 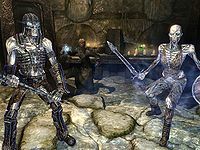 Female: "I think it's sweet Lu'ah is so worked up over her dead soldier..."
Male: "Yeah, but raising Draugr to take on both the Imperials and the Stormcloaks? That's just crazy." Female: "True, but I'm not going to be the one to try to oppose her..."
If the three warlocks detect you, you will have no choice but to battle them. Proceed forward to the third room, where a beam of blue light will shine down at the corpses, immediately reanimating them. The voice will once again be heard, saying, "Rise from your graves to defeat this worm!" 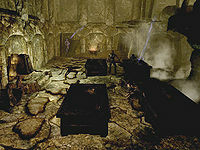 Defeat the four draugr enemies and proceed to the next room, but beware the ceiling spike trap. 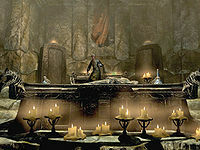 Head to the upper level and take the western path through more narrow tunnels until you reach a room with a conjurer and a flame atronach. Defeat the foes and examine the area to the north where you will find four rotating pillars and a handle. For a bit of investigation, search the table below the pillars for the unique book Lu-ah's Journal. The journal tells the story of yet another tragic love affair, this time between a conjurer named Lu'ah Al-Skaven and her husband Saeel. According to the journal, Saeel died fighting for the Empire against the Thalmor twenty-five years ago. 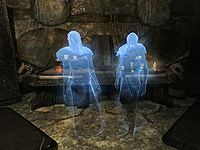 During her grieving period, Lu'ah learned the story of Fjori and Holgeir, which led her to Ansilvund, hoping to transfer Saeel's soul to Holgeir's body. In order to reach the burial chamber, she started reanimating the dead, using them as vessels to clear the way. As the Eagle finds its mates, so too did Fjori find hers in Holgeir, and a time of peace came to the clans of the forest. But the Snake came and bit Holgeir, its venom seeping deep into the wound. A Whale greeted Fjori's view as she came over the snow-covered mountains to the coast. But the Snake bit Fjori as she poured the last drop into Holgeir's mouth, and fatigued from her journey, she joined the ancestors immediately. From left to right, turn the pillars to match the words in the book. Alternatively, an easier solution is available. as the correct symbols can be found behind the table, mostly overgrown but still visible. With the pillars in place, pull the handle and the door to Ansilvund Burial Chambers will be accessible. "Rise from your graves to defeat this worm!" "I could not raise him, but I will raise an army to avenge his defilement!" Proceed forward and beware of even more traps until you reach a large iron door, the very entrance to the main burial hall, the location sought out by Lu'ah, and the place where she hoped to reanimate her husband through the body of Holgeir. Apparently, she failed. "Thank you for releasing us from her spell." "They burned his body before I could raise him... it should have been returned to me... You will not stop me from killing those who wage this pointless war!" Fjori: "Thank you for releasing us from her spell." Holgeir: "Now we can rest in peace once again. Come Fjori, my love..."
Fjori: "Take this with our gratitude." They will both disappear and your reward will be ready on the table behind them: the unique sword Ghostblade. Make sure to pick up the Unusual Gem, then loot Lu'ah Al-Skaven for her key and unlock the northern door. Inside you'll find a boss-leveled chest, the spell tome Transmute Mineral Ore, and a hefty amount of soul gems. Lastly, find the Imperial Condolences letter on the table for a final explanation on what drove Lu'ah Al-Skaven into insanity and why she formed her army of undead allies. The following empty quest stages were omitted from the table: 0, 5, 10, 19, 20, 30, 50, 51, 52, 55, 56, 57, 80, 90, 95. On the PC, it is possible to use the console to advance through the quest by entering setstage dunAnsilvundQST stage, where stage is the number of the stage you wish to complete. It is not possible to un-complete (i.e. go back) quest stages, but it is possible to clear all stages of the quest using resetquest dunAnsilvundQST.